“I am not sure I am an artist. I just know how to juggle. 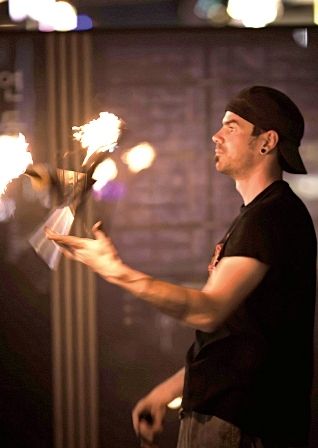 You need a big ego to say ‘I am an artist’, " says Lyon-native Matthieu Durin as we talk about his life as a juggler, market trader, husband and father. Clearly not a man of convention, the Frenchman and Jeju resident of three years is an itinerant performer and merchant, going against the grain in a country notorious for its grueling office culture. The island’s exoticism more than slakes his thirst for travel as he roves from market to market, with a festival or two in between, selling his handmade accessories and juggling “just as a way to express myself,” he says. 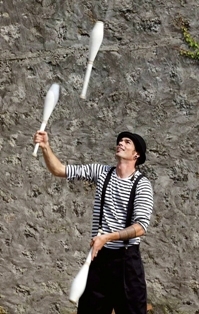 He learned his trade at university — “I juggled more than studied” — and his penchant for it has allowed him to bypass language barriers all across the world from Europe and Africa to Asia. 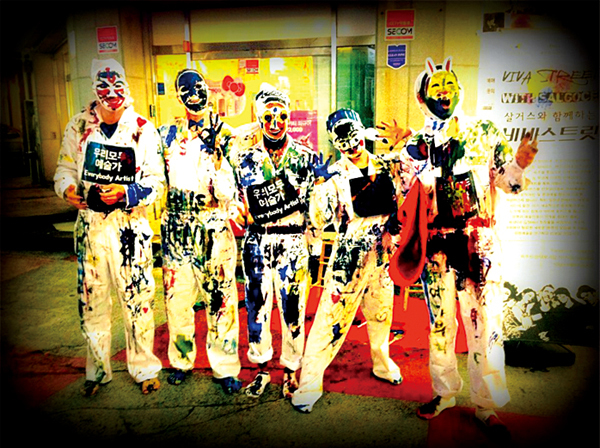 “It is always good to share artistic ideas with people on the street, especially if you don’t speak the language. Sometimes it is just aesthetics, something beautiful, other times we try to give a message about ecology, or about our hopes and fears. We always try to say something meaningful,” he adds. 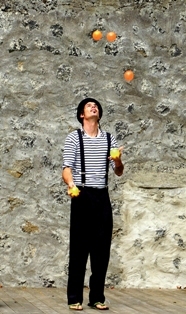 Known as Jeju Juggling when alone, the “we” is Salgoce, a six-strong troupe comprising one Korean, two French and three Japanese members. The name means a naughty kid who defies authority, hinting at their artistic approach. Their composition reflects this disregard for convention, being diverse in artistic and national background. It is the element’s primal essence that draws Matthieu to it and, appropriately, Salgoce will be performing at the Jeju Fire Festival next year. Matthieu’s own journey to Jeju is worthy of such a campfire setting. In fact, the first time I saw him he was telling it on the nationwide fly-on-the-wall documentary, Human Theater. His wife, Soo Yung, is a Korean adoptee brought up in France who long had no desire to return and explore her Korean roots. At 30 years of age, however, as the couple was in Korea en route to Japan, she decided the time was right to search out her hometown. The map showed two places with similar sounding names: Chungju and Cheongju. They opted for a bus to Chungju. It was the wrong city, but someone at City Hall took them to the local records office, and then on to a nearby police station. The next day she was face to face with her late father’s family. “It also allowed us to continue our traveling. It was the perfect idea,” he reflects. 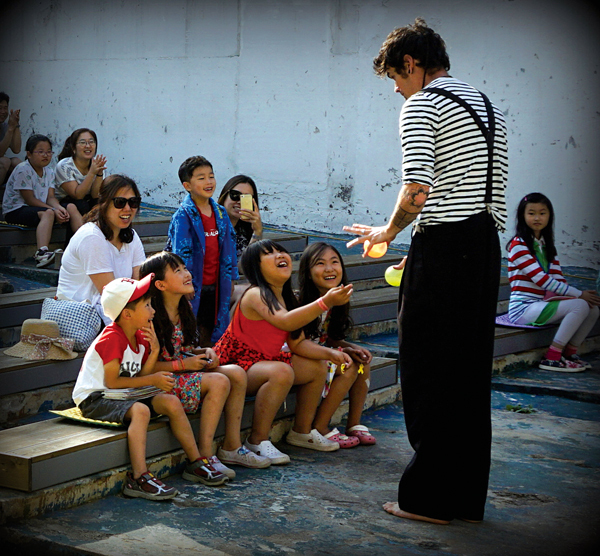 Building a family on Jeju has only deepened Matthieu's appreciation of childhood, and his latest project would see him perform for free at local hospitals as Jeju Juggling. He is looking for support from local hospitals so he can bring a smile to more children's faces. “I hope we can visit monthly from next year,” he adds. Matthieu doesn't expect riches doing what he loves, and Jeju's mountains, beaches and open spaces more than make up for that. The island is “perfect for a family,” he says, and he now feels at peace and full of hope for his son’s future. With everything he wants right here on the island, where does he see his future?